This topic describes several terms and concepts of keys on data tables, as they apply to Microsoft Dynamics AX. All keys are unique keys, meaning they disallow duplicate values and null values. 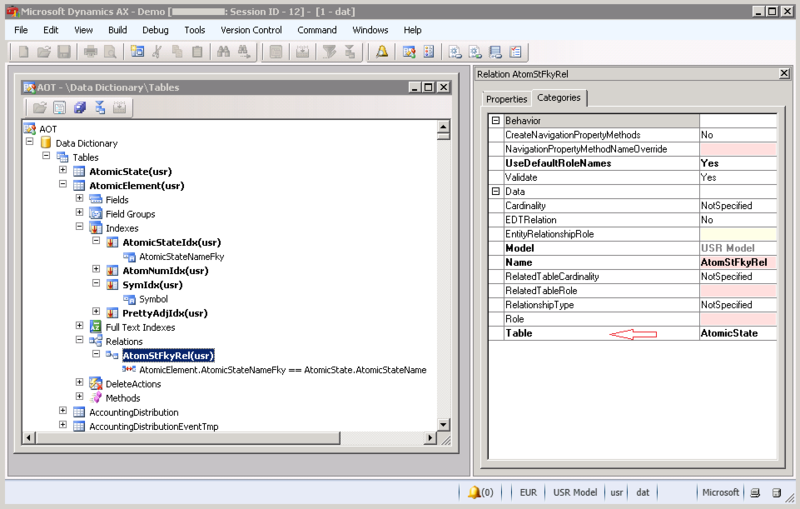 This section describes the terminology for keys that appear in property names in the AOT Properties window. A primary key is one type of key. The other type of key is an alternate key. There is a maximum of one primary key per table, whereas a table can have several alternate keys. The primary key is usually the type of key that other tables, called child tables, refer to when a foreign key field in those other tables need a relational identifier. Starting in Microsoft Dynamics AX 2012 the primary key for every new table is always enforced by an index that has exactly one field. The one field is usually an incremented number or a completely meaningless number that is generated by the system. For new tables the default is a primary key based on the RecId field. This is represented as the surrogate key in the user interface. The following table describes the PrimaryIndex property and other major properties that are related to keys. The drop-down list contains the surrogate key plus every index on the table that has its AlternateKey property set to Yes. This property controls whether the system creates a unique index on the RecId field. The default value is Yes. This is the basis of the surrogate key. No other field is added to this index, not even DataAreaId. The ClusterIndex value is given to the underlying Microsoft SQL Server database system as a performance tuning choice. This choice generally controls the physical sequence in which the records are stored in the underlying database. The following AOT image highlights the table properties that are related to keys. A table can have several alternate keys. Any one alternate key can switch to being the primary key, if the alternate key is comprised of only one field. A table can reference the alternate key of another table. However, it is more common for a table to reference the primary key of another table. As an option, an alternate key can be chosen as the ReplacementKey of a table. In practice each alternate key relies on a unique index for its implementation and enforcement. However, a unique index alone does not make an alternate key. The AlternateKey property must be set to Yes to make a unique index be an alternate key. The following table describes properties on the AOT node for an index. No means that the combined fields of the index must together make a value in each record which no other record has. Yes means that other tables can create foreign key relations that reference this key, as an alternative to referencing the primary key. Indexes with two or more fields cannot have their AlternateKey property value set to Yes. A key that is marked as a valid time state key is not a candidate key for child tables to reference in their foreign key relations. Instead, this key is meant for managing date effective data in its own table. The default is No. This field can be Yes only if the ValidTimeStateFieldType property is Yes on the table. Yes means this key contains the ValidFrom and ValidTo fields. The ValidTimeStateKey property cannot be set to Yes when the AlternateKey property is set to No. The following image shows that the SymIdx index is an alternate key. Its AlternateKey property is set to Yes. 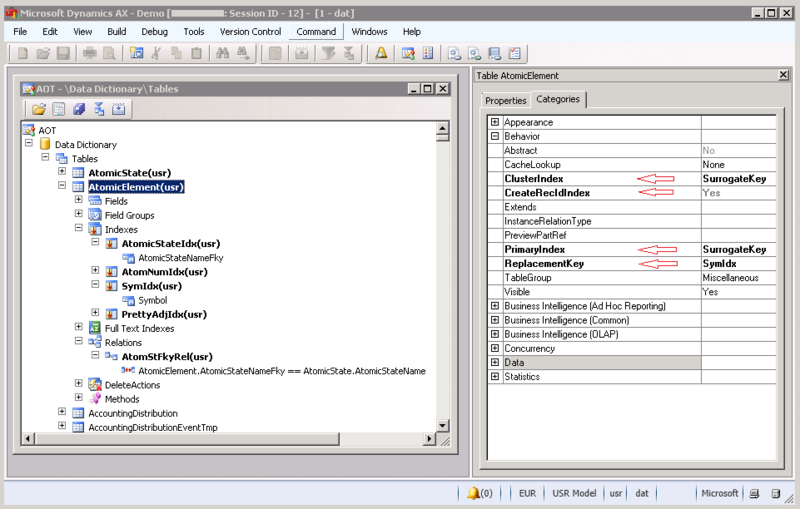 In Microsoft Dynamics AX a relation represents a foreign key. The following image shows that the AtomStIdx alternate key of the AtomicState parent table is referenced by this foreign key of the AtomicElement child table. The foreign key is comprised of the AtomicStateName field. The following image displays the AtomStIdx alternate key on the AtomicState table. The previous AtomStFkyRel relation references this alternate key. For more information about the properties of table relations, see Table Relation Properties. The replacement key is chosen by setting the ReplacementKey property on the table. The drop-down list offers every alternate key as an available value. In the previous image of the AtomicElement table properties, the ReplacementKey property is SymIdx. In Microsoft Dynamics AX, there are other terms that are used to describe table keys. These terms do not appear as property names in Microsoft Dynamics AX. These terms are described in the following table. 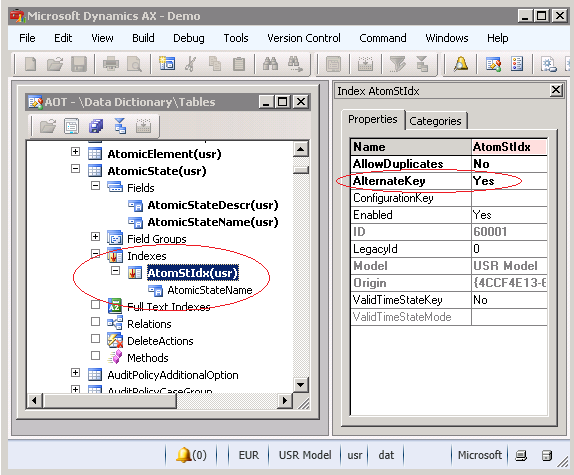 In Microsoft Dynamics AX, an AOT node under MyTable > Relations represents a foreign key. For more information, see the previous Relations section in this topic. A key whose value has meaning to people. Most replacement keys are natural keys. A key whose value has no meaning to people. A large number generated by the system, such as RecId, could be a surrogate key. A broad term that applies to primary keys and to alternate keys. It does not apply to foreign keys. This term emphasizes that all values for a given key must be unique within one table. All fields in a unique key must be not-nullable.